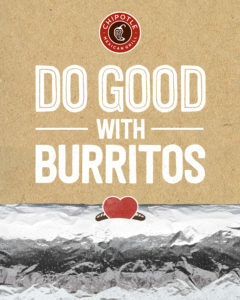 Enjoy a burrito and CAUSE AN EFFECT! All God’s Children has an enduring commitment to the recovery community, with seven groups meeting in our church every week. We have an outstanding opportunity to further extend our support in collaboration with ‘Minnesota Young Adults 4 Recovery’ to provide even more services right in our building– food shelf items, job seeking support and more. Eat at Chipotle at 2600 Hennepin Ave. on Tuesday, April 2 between 4:00 pm and 8:00 pm! Let the cashier know you’re supporting this cause to make sure 33% of the proceeds will go to this incredibly worthy effort. See the flyer for details. Enjoy a burrito and CAUSE AN EFFECT! Your support will make a difference!